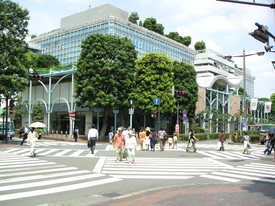 Futakotamagawa Amity is located 3 minutes from Futakotamagawa station in the Setagaya district on the Tokyu Denen Toshi Line. Not only do we aim to strengthen our students’ English conversation skills, but also we look at each student’s personality to meet their needs. Please feel free to contact us at any time. Welcome to our happy school at Futako Tamagawa. We have lessons for 6 months old to adults with a good environment. We look forwart to meeting you here at Futako-Tamagawa Amity! The staff at Futako Tamagawa love working with our students. Our school has a happy and welcoming environment. Futako Tamagawa is a beautiful area filled with parks and three large shopping centers. It is a great place to live and work in the Tokyo area. Our school is close to the Tama River which is good for playing sports, relaxing, or having a picnic. Foreign teacher classes have lots of fun and educational activities. The students love learning both a different language and a different culture. In our active learning environment, parents and their children enjoy stories, songs and other educational activities. Students can also enroll in interactive computer classes that provide a multimedia approach to English language acquisition. Even very young babies learn English at Amity! An early start provides a strong foundation for future learning.